I’ve shared multiple times how my pure joy for Tiffany and Company has allowed me to meet some extraordinary people and even connect with some. Today’s post is an example of this…..
Back in March when I hosted the screening of Crazy About Tiffany’s at Railroad Square Cinema in Waterville, Maine most of the attendees were colleagues, friends, or family members. As the movie concluded, I handed out the cookies to all my guests and thanked them. One particular lady that I was not familiar with thanked me and shared that she use to teach a merchandising class at Thomas College also in Waterville, Maine and during spring break she would take her students to Tiffany and Company in NYC for a tour and observe their window displays. I was quite intrigued but didn’t have the time to talk more in-depth with her. I luckily noticed a colleague who seemed to recognize her so when I returned to work I inquired. I was able to track down her name and sent her a FB message but didn’t receive a response until lucky for me she located my email address and asked if I might like to join her for lunch. Fast forward to a couple weeks ago and I had the pleasure of meeting her for lunch and sharing how my cameo in the film came about as well as details of my Tiffany-themed wedding. She is now a retired professor but keeps plenty busy, however, I am sure it was a great adventure for the many students who experienced going to NYC with her. 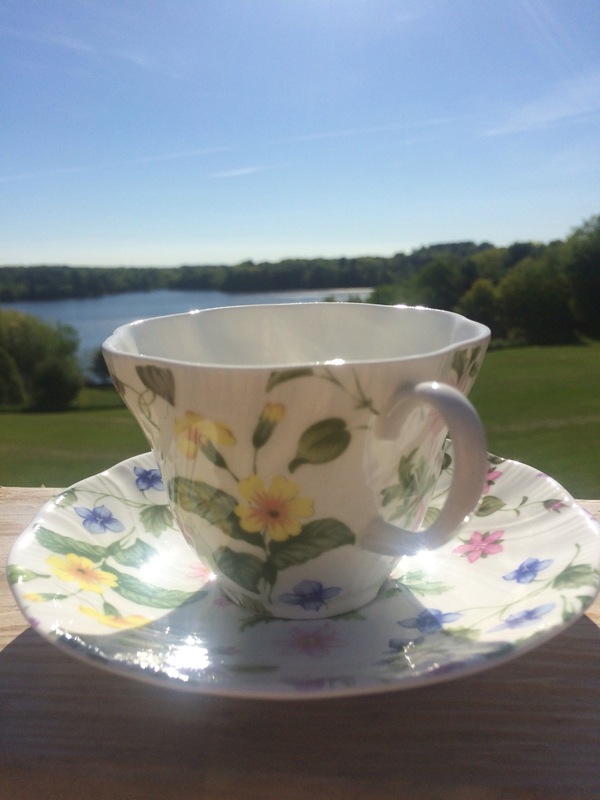 I enjoyed our conversation and she surprised me with such a lovely gift…the teacup you see pictured above. It was a Tiffany gift she had given to her mother-in-law but ended up back in the possession of and was kind enough to gift me this beautiful teacup and saucer. I’ve already put it to great use. If you haven’t already guessed I’m an extrovert so any chance I have to meet new people I just love. I can’t wait to meet Betty-Jane for lunch again soon and hear more about her. What is the coolest Tiffany connection you’ve made? I would love to hear about it, feel free to leave a comment or drop me a message.